Fresh attempt by convicted former deputy national chairman of the ruling Peoples Democratic Party, PDP, Chief Olabode George to regain freedom from prison custody suffered a temporary setback on Thursday, November 19 when the Court of Appeal hearing his application for post conviction bail adjourned till December 1 following protests from counsel to other five convicts . Interestingly, the court began sitting in Lagos without Justice Bode Rhodes- Vivour. 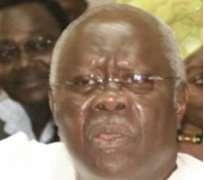 The Economic and Financial Crimes Commission, EFCC had kicked against the inclusion of Justice Rhodes-Vivour among the panel of Justices to consider Chief George's appeal, alleging that the Appeal Court Judge was biased, having been mentioned in an allegation that he allegedly pressurized Justice Olubunmi Oyewole of the Ikeja High Court to set free the politician. When the case came up Thursday, Justice Rhodes Vivour was conspicuously missing as Justice Dingba Menson led a panel of three justices. The bail application was however adjourned to December 1, for argument following the request by other convicts to be joined in the matter. When Mr. Tunji Ayanlaja (SAN), leading Mr. Kanu Agabi, former Attorney General of the Federation and Minister of Justice and eight other lawyers for Chief Bode George was asked by Justice Dingba Menson to present his case, counsel to five other convicts raised objection. Mr. Joe Garzama, SAN, leading counsel to one of the appellants told the Justices that they received hearing notice in respect of Bode George while his co- convicts were not included. He therefore pleaded with the court to take the bail applications together as was done in the lower court as the cases were similar. But counsel to the respondent, , Mr. Tony Omaghomi objected, arguing that if the other appellants wanted their applications to be heard by the court, it has to come by way of a motion. Justice Menson agreed with the respondent's counsel but warned against reading meaning into the fact that the hearing notice was issued only in respect of Bode George's case. She explained further that as of the time the notice was issued, the counsel to the other appellants had not brought anything to the notice of the court. She then asked Mr. Ayanlaja, if he was ready to go on with the case. But the lead counsel to Bode George said he would prefer the cases went on together since they were going to adopt the same argument. At that juncture, the judge adjourned proceedings to December 1, for consolidated hearing.